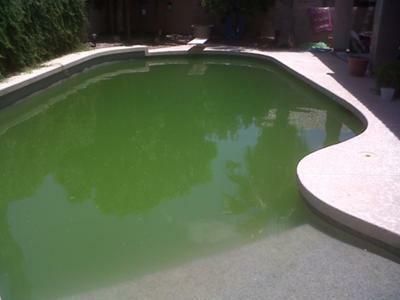 The summer is here and just when you thought you will spend eons in the pool, you discover that it is turning green! No need to panic though. We know it is a nasty sight to behold and you are probably having shivers right now, but that is why we are here to help you. Here is a step by step guide on what to do. Why is the Pool Green? This is important because if the pool is way too green, then the following steps will be of no use. You will have to get the pool drained and washed with acid. In cases where the pool is black, getting it acid washed is the only way to go. If you are able to see at least 6-8 inches below the water surface, then it is likely for the following steps in chemical treatment to work. The greenness of the pool means there is little if any chlorine in it. You won't need to test it for chlorine. What you need to test is the pH of the water. If the pH is very high, shocking the pool will make the water turn very cloudy. Whichever way though, a shocked pool will remain cloudy until all the solids and dead algae are successfully filtered off. To be really accurate, get a high-end testing kit for the pH. The readings should be below 7.2. If the figure is higher, add a gallon of muriatic acid. Don't worry if you think you have added too much of the acid because a pool can be sustained at a slightly high acidic level (low pH). Once the pool reaches a pH of 7.2 or below, it's time to shock it with calcium hypochlorite which is granular chlorine. It is best to purchase one container of 25 pounds of granular chlorine rather than the commonly packaged 1 pound bags. This will save you a good amount of money and besides, you will need to keep some in storage for when you need to use it in smaller amounts. Use 5 pounds or 10 gallons of granular or liquid chlorine respectively. Broadcast the chlorine (using the filter pump) evenly on the entire surface of the pool until you use up all the chlorine. After a few hours of circulation, spray in a good quality algaecide. Also add a flossing agent that will cause the dead algae to form clumps and making it easy to filter out. The type of filter will determine how you will carry out the task. Diatomaceous Filter (DE): You will need to first backwash this filter then add fresh DE powder. Run the pump for 24 hours while shocking the pool as explained in the previous part. Ensure that there are no leaves or other things in the pool that can cause an obstruction in the pool while the pump is running. If the pool is too green for the drain to be visible, run a brush where you expect the drain to be at the pool's deep end side. Cartridge filter: You need to ensure that it is rinsed thoroughly and is in good working condition then follow the steps as those of the DE filter. DE filter will need to be repaired or maintained if the cloudiness takes too long to clear; it is a sign of clogging. Once you have turned the green pool to a clean pool, you will want to maintain it that way. You can do this by making sure you have a chlorinating system that is reliable. A floater, in-line or salt system will serve you well. Utilize a water clarification solution and finally, clean your filters regularly; get a DE filter for more efficient cleaning.